October 31st is your last chance to get cheap access to thousands of bikes all over the city. Think of Capital Bikeshare like Zipcar-for-bikes: Put in your key and take a bike, and then get charged by the hour for when you use it. If you think you’ll borrow a bike more than 10 days a year, it’s totally worth the $50 cost to join now. Better than that, for rides under 30 minutes, you won’t pay a dime in usage fees. That means if you just need a quick bike through downtown on your lunch break, you can grab a bike for free and go from Capitol Hill to Georgetown without paying any usage fees. 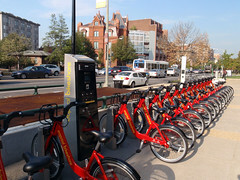 SmartBike is no longer managing bike sharing in DC- DDOT kicked them to the curb. Probably for the reasons Tom cited- there were only ever 10 stations/100 bikes, and you had to return them to the station you got them from. Yeah, they were cheaper, but that’s because the service was considerably smaller.